The aim of this study was to analyze the clinical results of endovascular treatment for occlusion of longsegment iliac artery (>10 cm). The clinical data of endovascular treatment for 20 patients (29 limbs) with occlusion of long-segment iliac artery were performed retrospective analysis during December, 2012 and December, 2015. 15 cases were performed direct balloon-expandable stent implantation, and 5 cases were performed balloon-expandable stent implantation after thrombolysis. All patients were performed outpatient follow-up and the follow-up rate of 15 cases (18 limbs) was 75%. The re-canalizing rate of iliac artery was 100%, the combined groin following lesion re-canalizing rate was 72.7%. The average ankle-brachial index (ABI) in preoperative and postoperative week were (0.28 ± 0.12) and (0.72 ± 0.21), the difference was statistically significant (P<0.05). The follow up rate of 15 cases (18 limbs) was 83.3%, up for 3-24 months. The re-canalizing rate of iliac artery in the first phase was 94.4% (17/18), and 100% for the second. The endovascular treatment for occlusion of long-segment iliac artery was minimally invasive, effective and safe, the recent re-canalizing rate and the limb salvage rate were high, which can be used as the preferred treatment for occlusion of long-segment iliac artery. Peripheral arterial disease (PAD) was a common and frequently occurring disease, mainly involving the lower section of the abdominal aorta, iliac artery, femoral artery, popliteal artery and others. The clinical manifestations were symptoms such as intermittent claudication and limb ischemic pain, even necrosis , with a high mortality and morbidity . According to the guidelines published in the Trans-Atlantic Collaboration Consensus (TASC) meeting in 2000  and TASCII meeting in 2007 , arteriosclerosis obliterans of lower limbs was divided into 4 types, it was proposed that type A and B lesions were more suitable for endovascular treatment, and type C and D lesions adapted to surgical treatment. However, with the advancement in interventional techniques and intervention materials, as well as the improvement of efficacy and success rates in interventional therapy, more and more patients with type TASC-C and D aortoiliac and femoropopliteal arteriosclerosis obliterans chose endovascular treatment [5-8]. Torres-Blanco et al. obtained that endovascular treatment for TASCII-D lesions was safe by analyzing the interim results of endovascular treatment for TASCII-D lesions, and the satisfactory results were obtained. From December, 2012 to December, 2015, 20 patients with occlusion of long-segment iliac artery in People's Hospital of Ganzhou City were performed endovascular treatment, the lesion type was TASCII-D. In this paper, a retrospective analysis of the above cases was carried out, and the treatment effect was evaluated. It was reported as follows. A total of 20 male cases with a total of 29 limbs, aged 48 to 80 years old, with duration of 0.5 to 36 months were selected, including 7 cases with simply iliac artery lesions, 2 cases with iliac artery occlusion, 11 cases with iliac artery combined groin following arterial occlusion. All iliac artery occlusive lesion length were more than 10 cm, the TASCII type was D. According to Rutherford classification criteria , 2 cases belonged to class 3, 6 cases to class 4, 5 cases to class 5, 7 cases to class 6 (Table 1). The mean preoperative anklebrachial index (ABI) was (0.28 ± 0.12). The associated risk factors included hypertension in 9 cases, smoking history in 18 cases, hyperlipidemia in 13 cases, coronary heart disease in 4 cases, as well as 2 patients had a history of myocardial infarction, one case with coronary stents surgery history, 8 cases with diabetes history, 3 patients with a history of cerebrovascular disease, 1 case with rectal cancer surgery history. This study was conducted in accordance with the declaration of Helsinki. This study was conducted with approval from the Ethics Committee of People's Hospital of Ganzhou City. Written informed consent was obtained from all participants. Note: The classification of chronic limb ischemia. The number in brackets indicated the number of limbs. Table 1: Distribution of Rutherford grade lesions and anatomic parts. Cases with symptoms were in line with the diagnostic criteria of peripheral arterial disease (PAD), with associated symptoms were selected. The lesions were confirmed by preoperative ABI, vascular ultrasound, magnetic resonance angiography (MRA) examination, and meet TASCII-D-type classification criteria. Cases without endovascular treatment for occlusion of iliac artery, connective tissue diseases such as thromboangiitis obliterans and arteries, with significant organ failure or serious dysfunction unable to tolerate endovascular treatment. (1) Diagnosed lesions by routine examination, assessed important organ function; (2) Regulated blood pressure, blood sugar, cholesterol, antiplatelet therapy by medication; (3) Analyzed the image information to select surgery program; (4) Got ready for surgery supplies, such as balloon catheters, intravascular bare stents, catheter guide wire with special type; (5) Made good communication between doctors and patients before surgery. Selected the appropriate blood vessel puncture depending on the lesions. For TASCII-D aortoiliac artery and TASCII-D complex lesions of iliac artery, contralateral femoral artery puncture or joint brachial artery, ipsilateral distal retrograde femoral artery puncture generally could be chosen . Of the patients in this study, 11 cases were performed contralateral femoral artery puncture "crossover" to process the ipsilateral iliac artery and groin following arterial occlusion, the guide wire into a loop was used to assist catheter "crossover" the long-segment occlusion iliac artery technique, as shown in Figures 1-4 (the same patient). The other four cases were associated ipsilateral brachial artery puncture, five cases associated ipsilateral femoral artery retrograde puncture. Figure 1: The left common iliac artery, internal and external longsegment iliac artery occlusion. Guidewire into a loop assisted catheter "crossover" long-segment iliac artery occlusion (the same case). 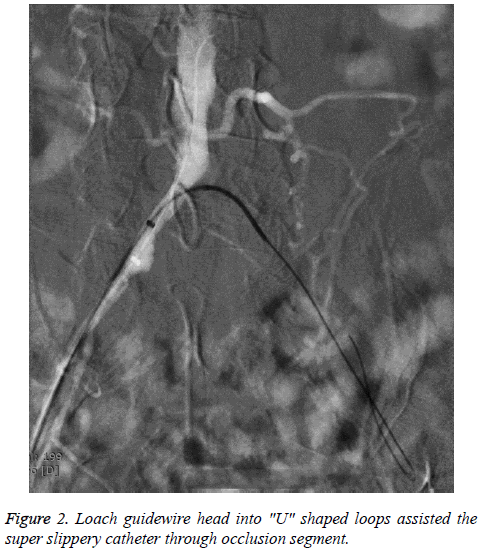 Figure 2: Loach guidewire head into "U" shaped loops assisted the super slippery catheter through occlusion segment. 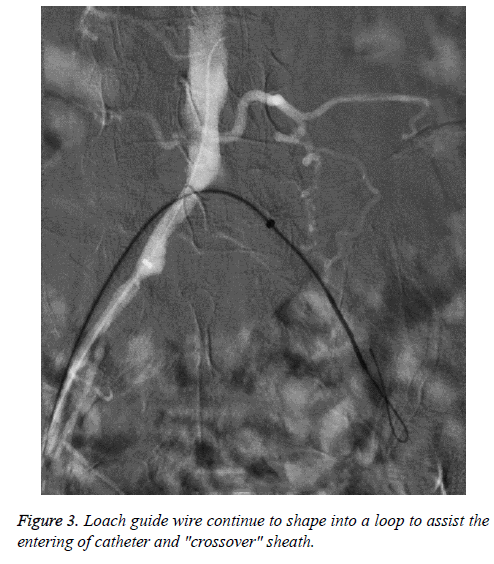 Figure 3: Loach guide wire continue to shape into a loop to assist the entering of catheter and "crossover" sheath. 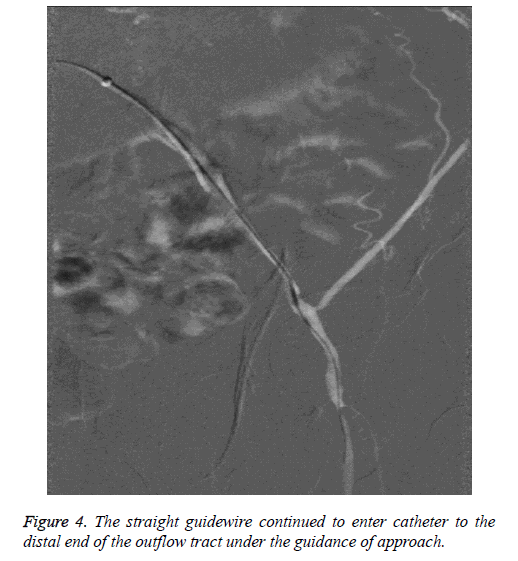 Figure 4: The straight guidewire continued to enter catheter to the distal end of the outflow tract under the guidance of approach. For TASCII-D-type lesions secondary to thrombosis in nine limbs of two cases with iliac artery occlusion, one case with iliac artery occlusion and 2 cases with femoral artery occlusion were firstly performed catheter-directed thrombolysis (CDT). Then urokinase was used , the dose used in the first 12 h was 50,000 U/h, followed by 30,000 U/h, thrombolysis ranged from 1-3 days, percutaneous transluminal angioplasty (PTA) plus stenting was performed after thrombolysis. The guidewire in 9 limb got through the occlusion via true lumen. For the eight limb lesions in the other six cases with simple iliac artery occlusion, and 12 limb lesions in 9 cases with groin following occlusion iliac artery lesions were performed direct PTA +stenting. Of the 15 patients, the guidewire for 3 iliac artery lesions and 5 superficial femoral artery lesions got through the intima, and performed subintimal angioplasty (SIA). Of which, 3 patients with superficial femoral artery were not to be opened. Low molecular weight heparin anticoagulant therapy was carried out for 3-5 days, orally took aspirin and hydrochloric acid sarpogrelate, and single aspirin after three months. The review of ABI was performed about 1 week after surgery. Clinic regularly follow up was carried out after discharge. The time points were the 1th, 3th, 6th and 12th month after discharge, following by one year later. The follow-up modes were ABI measurement, vascular ultrasound, MRA examination and others. Two cases had lower abdominal aorta occlusion, all 29 iliac artery lesions were successfully opened, and eight cases accompanied by the groin following occlusion were also opened. One abdominal aorta bare stent, 29 iliac artery bare stents, and 9 groin following artery bare stents were used. The re-canalizing rate of iliac artery was 100%, and 72.7% for groin following lesions. The collateral circulation of the non-opened three cases with superficial femoral artery lesions was rich. The symptom of all patients was relieved, including intermittent claudication disappeared in eight cases, rest pain disappeared in 5 cases, foot ulcer healing in 5 cases, two cases had toe amputation. One week after surgery, the average ABI was (0.72 ± 0.21), the difference was statistically significant compared with that before surgery (P<0.05) (Table 2). Table 2: Results of the operations. One case had intraoperative upper gastrointestinal bleeding and hypotension. 1 case had postoperative puncture site bleeding and pseudoaneurysm, 1 case had hallux toe blue toe syndrome, no perioperative deaths occurred. All patients were planed to receive regular clinic follow-up. The follow up rate of 15 cases (18 limbs) was 75%, up for 3-24 months, with an average of nine months, the re-canalizing rate of iliac artery in the first phase was 94.4% (17/18), including 1 patient had blood clot formation within the iliac artery stenting on one side within the first 11 months, repeated intubation thrombolytic recanalization was performed, the secondary re-canalizing rate was 100%. The main purpose of PAD treatment was to relieve symptoms, preserve limbs and reduce amputation. The treatment ways included traditional open surgery and rapid developed endovascular treatment in recent years. TASCII Guidelines  still recommended traditional surgical bypass surgery for the type D iliac artery lesions, because of its curative effect. However, the surgical trauma was big, recovery time was long, complications were more, with a certain degree of mortality . The body situation of such patients was generally poor, with many and serious systemic diseases, so strike capability of tolerance surgery was poor. While the EVT had advantages such as minimally invasive, relatively simple operation, rapid recovery, fewer complications, can be repeated several times, easily accepted by patients , and may be carried out under local anesthesia, which reduced the risk of anesthesia. 12 cases of the patients in this study had severe lower limb ischemia combined coronary heart disease, diabetes, cerebrovascular and other systemic diseases, the general condition was poor. Miyamoto et al. obtained TASCIID single iliac artery lesions were suitable for EVT by controlled study for TASCIIB and D single iliac artery lesions treatment effect. Ye et al. performed Meta-analysis for the status of TASC-C and D aortoiliac arteriosclerosis occlusion disease by endovascular treatment, and believed that angioplasty and stenting implanting got a good close and mid-term results in treating TASC-C and D iliac artery arteriosclerosis obliterans. Baril et al. believed that endovascular treatment for lower limb TASCIID lesions can improve hemodynamics in lower limb, got a higher limb salvage rate, but which needed for further follow-up to ensure the long-term efficacy of these interventions. The long-segment iliac artery occlusion was often caused by arteriosclerosis, plaque formation or mixed thrombus ingredients. For plaque with occlusion as a main component, guidewire entering into the approach "crossover" was often hampered by hardened plaque, the catheter guidewire can easily rebound to the abdominal aorta, "crossover" failed. To obtain a valid support for guidewire brace, the "J" shape of guidewire head was molded into "U" shaped loop, the "U" shaped loop was used to provide tension on the vessel wall, the entering for catheter did not rebound into the abdomen aorta. In addition, because the loop head had big contact surface with the vessel wall, the guidewire was not easy to enter the collateral vessels, prompting the guidewire entered by breakthrough advances along the true lumen of iliac artery . If the guidewire cannot enter the artery dissection via the occluded vessel true lumen, subintimal angioplasty (SIA) could be performed. In the study, the guidewire true lumen got through the iliac artery of 26 limbs, SIA for 3 limbs. The lesion thrombus ingredients also needed to take seriously. PAD secondary thrombosis often had a history of a sudden worsening of chronic lower limb ischemia symptoms in the course of the disease, clinically manifesting as acute arterial occlusion features. Of the patients in this study, five cases had lame suddenly increase on the basis of intermittent lame symptoms, the presence of lesions in thrombus was confirmed according to the filming. If PTA was performed for such patients, thrombosis may shed into the distal due to balloon dilation. Therefore, if the preoperative or intraoperative PAD secondary thrombosis was suspected, CDT should be considered firstly in EVT process, further other measures could be taken in the following [18,19]. After catheter thrombolysis, some original long segment and complex lesions turned into short segments and simple lesions, which may be downgraded to TASCII C, B and A lesions, which reduced complications such as difficulty of operation and thromboembolism, shortened the bracket length and reduced the number of the stents used by patients, thereby reducing the cost and improving the occlusion of the re-canalizing rate . In this study, 9 limbs had associated thrombotic lesions, and performed CDT to dissolve the mixed thrombus ingredient in lesions, then PTA+stent therapy. For patients with combined lesions in iliac artery and superficial femoral artery, whether superficial femoral artery lesions must be solved at the same period after stent placement for iliac artery must, it was controversial. The effect can be observed after treatment of iliac artery lesions, for example, if the lower limb ischemia symptoms was estimated to be able to significantly improved, the distal arteries invasive intervention at the same period was not necessary. Of the patients in this study, 3 patients were not performed re-canalizing for occluded superficial femoral artery after re-canalizing for iliac artery, but new traffic branch vessels increased around the superficial femoral artery lesions. The postoperative ABI index increased significantly, lower limb ischemic symptoms were improved, ulcer also succeeded in healing, which achieved the desired clinical effect. Although endovascular treatment was minimally invasive, there will still be a certain percentage of complications, such as contrast nephropathy complications; puncture site bleeding, hematoma, pseudoaneurysm, arteriovenous fistula, infection and other complications; perforation bleeding when guidewire entered through the lesion, dissection and other complications; blood vessels rupture, plaque off, acute stent thrombosis during catheter ball expanding stent and other complications; systemic complications such as myocardial infarction, arrhythmia, syncope, respiratory failure and gastrointestinal bleeding . Of these patients, 1 case had puncture site hemorrhage and pseudoaneurysm, 1 case had emboli distal embolization, 1 case had upper gastrointestinal bleeding and hypotension, but without serious complications caused deaths of patients. The total complication rate was 15% (3/20), a higher incidence may be related to the small number of cases. In summary, the endovascular treatment for occlusion of longsegment iliac artery was minimally invasive, effective and safe, the recent re-canalizing and limb salvage rate were higher, which could be used as the preferred treatment for iliac artery occlusion disease. Saleh HM, Gabr AK, Tawfik MM, Abouellail H. Prospective, randomized study of cutting balloon angioplasty versus conventional balloon angioplasty for the treatment of hemodialysis access stenoses. J Vasc Surg 2014; 60: 735-740. Patel MR, Conte MS, Cutlip DE, Dib N, Geraghty P, Gray W, Hiatt WR, Ho M, Ikeda K, Ikeno F, Jaff MR, Jones WS, Kawahara M, Lookstein RA, Mehran R, Misra S, Norgren L, Olin JW, Povsic TJ, Rosenfield K, Rundback J, Shamoun F, Tcheng J, Tsai TT, Suzuki Y, Vranckx P, Wiechmann BN, White CJ, Yokoi H, Krucoff MW. Evaluation and treatment of patients with lower extremity peripheral artery disease: consensus definitions from Peripheral Academic Research Consortium (PARC). J Am Coll Cardiol 2015; 65: 931-941. Dormandy JA, Rutherford RB. Management of peripheral arterial disease (PAD). TASC Working Group. Trans Atlantic Inter-Society Consensus (TASC). J Vasc Surg 2000; 31: S1-S296. Norgren L, Hiatt WR, Dormandy JA, Nehler MR, Harris KA, Fowkes FG, TASC II Working Group. Inter-society consensus for the management of peripheral arterial disease (TASC II). Eur J Vasc Endovasc Surg 2007; 45 Suppl S: S5-67. Ye W, Liu CW, Ricco JB, Mani K, Zeng R, Jiang J. Early and late outcomes of percutaneous treatment of Trans Atlantic Inter-Society Consensus class C and D aortoiliac lesions. J Vasc Surg 2011; 53: 1728-1737. Iida O, Nakamura M, Yamauchi Y, Kawasaki D, Yokoi Y, Yokoi H, Soga Y, Zen K, Hirano K, Suematsu N, Inoue N, Suzuki K, Shintani Y, Miyashita Y, Urasawa K, Kitano I, Yamaoka T, Murakami T, Uesugi M, Tsuchiya T, Shinke T, Oba Y, Ohura N, Hamasaki T, Nanto S. Endovascular treatment for infrainguinal vessels in patients with critical limb ischemia: OLIVE registry, a prospective, multicenter study in Japan with 12-month followup. Circ Cardiovasc Interv 2013; 6: 68-76. Han DK, Shah TR, Ellozy SH, Vouyouka AG, Marin ML, Faries PL. The success of endovascular therapy for all TransAtlantic Society Consensus graded femoropopliteal lesions. Ann Vasc Surg 2011; 25: 15-24. Torres-Blanco Á, Edo-Fleta G, Gómez-Palonés F, Molina-Nácher V, Ortiz-Monzón E. Mid-Term Outcomes of Endovascular Treatment for TASC-II D Femoropopliteal Occlusive Disease with Critical Limb Ischemia. Cardiovasc Intervent Radiol 2016; 39: 344-352. Suzuki K, Mizutani Y, Soga Y, Iida O, Kawasaki D, Yamauchi Y, Hirano K, Koshida R, Kamoi D, Tazaki J, Higashitani M, Shintani Y, Yamaoka T, Okazaki S, Suematsu N, Tsuchiya T, Miyashita Y, Shinozaki N, Takahashi H, Inoue N. Efficacy and Safety of Endovascular Therapy for Aortoiliac TASC D Lesions. Angiology 2017; 68: 67-73. Rutherford RB, Baker JD, Ernst C, Johnston KW, Porter JM, Ahn S, Jones DN. Recommended standards for reports dealing with lower extremity ischemia: revised version. J Vasc Surg 1997; 26: 517-538. Stavroulakis K, Usai MV, Torsello G, Schwindt A, Stachmann A, Beropoulis E, Bisdas T. Efficacy and Safety of Transbrachial Access for Iliac Endovascular Interventions. J Endovasc Ther 2016; 23: 454-460. Ebben HP, Nederhoed JH, Lely RJ, Meijerink MR, van der Meijs BB, Wisselink W, Yeung KK, Hoksbergen AW. Low-dose thrombolysis for thromboembolic lower extremity arterial occlusions is effective without major hemorrhagic complications. Eur J Vasc Endovasc Surg 2014; 48: 551-558. Timaran CH, Prault TL, Stevens SL, Freeman MB, Goldman MH. Iliac artery stenting versus surgical reconstruction for TASC (TransAtlantic Inter Society Consensus) type B and type C iliac lesions. J Vasc Surg 2003; 38: 272-278. Adili F, Balzer K, Betz T, Billing A, Böckler D, Brixner D, Debus SE, Donas KP, Eckstein HH, Florek HJ, Gkremoutis A, Grundmann R, Hupp T, Keck T, Gerß J, Klonek W, Lang W, Ludwig U, May B, Meyer A, Mühling B, Oberhuber A, Reinecke H, Reinhold C, Ritter RG, Schelzig H, Schlensack C, Schmitz-Rixen T, Schulte KL, Spohn M, Stavroulakis K, Steinbauer M, Storck M, Trede M, Weis-Müller B, Wenk H, Zeller T, Zimmermann A. Current practice of first-line treatment strategies in patients with critical limb ischemia. J Vasc Surg 2015; 62: 965-973. Miyamoto N, Kawasaki R, Fukuda T, Yamaguchi M, Sugimura K, Sugimoto K. Endovascular treatment for unilateral chronic total occlusions of the iliae artery categorized as TASC II type D lesions. Surg Today 2015; 45: 162-167. Baril DT, Chaer RA, Rhee RY, Makaroun MS, Marone LK. Endovascular interventions for TASC II D femoropopliteal lesions. J Vasc Surg 2010; 51: 1406-1412. Wang JB, Zhao JG, Li MH, Zhu YQ, Wang J, Zhang PL. An effective guidewire looping technique for the recanalization of occlusive segments of infrapopliteal vessels. Korean J Radiol 2010; 11: 441-448. Dakhil B, Lacal P, Abdesselam AB, Couffinhal JC, Gordienco A, Bagan P. Evaluation of balloon catheter-guided intra-arterial thrombolysis for acute peripheral arterial occlusion. Ann Vasc Surg 2013; 27: 781-784. Clair DG, Beach JM. Strategies for managing aortoiliac occlusions: access, treatment and outcomes. Expert Rev Cardiovasc Ther 2015; 13: 551-563. Alonso-Coello P, Bellmunt S, McGorrian C, Anand SS, Guzman R, Criqui MH, Akl EA, Olav Vandvik P, Lansberg MG, Guyatt GH, Spencer FA, American College of Chest Physicians. Antithrombotic therapy in peripheral artery disease: Antithrombotic Therapy and Prevention of Thrombosis, 9th ed: American College of Chest Physicians Evidence-Based Clinical Practice Guidelines. Chest 2012; 141: e669S-690S. Indes JE, Pfaff MJ, Farrokhyar F, Brown H, Hashim P, Cheung K, Sosa JA. Clinical outcomes of 5358 patients undergoing direct open bypass or endovascular treatment for aortoiliae occlusive disease: a systematic review and meta-analysis. J Endovasc Ther 2013; 20: 443-455.